CyclingJoe: Any Takers for Sandy Springs Bicycling Advocacy? Any Takers for Sandy Springs Bicycling Advocacy? See the photo of the recent widening of a segment of Glenridge Drive, just west of GA-400. They could have provided bike lanes – or at least very wide shoulders – by simply striping the lane widths… New developments come in without putting in the 4-5 foot setback and leaving room to build a bike lane or wider shoulder (Dunwoody does this & is spelled out in their ordinance). See the new townhomes going in on the west side of Glenridge just north of 285. They could have installed bike lanes in addition to sidewalks.). Are there ANY individuals, businesses or organizations based in Sandy Springs that would want to spend a couple of hours a month in their hometown to help make Sandy Springs a safer place for people of all ages & abilities to ride a bike? A few years ago I tried to start up an advocacy effort in Sandy Springs aka “Bike Sandy Springs”. The group exists on Facebook and the most activity I see is a weekly Sunday bike ride. As you know, I’m focused on Dunwoody, where I live. But we all ride around the different towns & counties, it’s very transparent and we’re all connected. I cannot lead efforts in Sandy Springs. But I am willing to assist in building the momentum and getting interested people together to move forward. With focused advocacy efforts, Sandy Springs could become a safer place to ride a bike for people of all ages & abilities. Road projects & developments happen each year without providing bicycle accommodation. Do you think UPS would like to have something like a Protected Bike Lane (see below) running all along Abernathy, between the Sandy Springs MARTA station and Roswell Road? Doing so would connect and open up another option for their employees to get to work, and provide a “last mile connectivity” option without requiring a motor vehicle, reducing congestion. Georgia Bikes provides “Seed Grants” to fledging advocacy organizations to help fund startup costs. As the current Vice President of Georgia Bikes, I could help in the application process. We can bring in the Executive Director, Brent Buice to meet and assist in getting started. Bike Alpharetta received a grant in 2011, and is now an official IRS-designated Non-Profit 501(c)3. All it takes to get started is a half-dozen individuals dedicated to spending 2-4 hours a month. That’s it…. Good stuff Joe! Good work and appreciate your efforts. My main concern remains that non-protected/non-segregated bike lanes do more harm than good in my humble opinion. 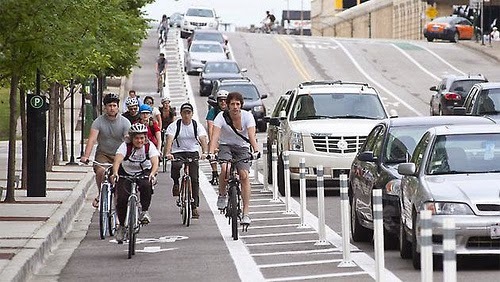 The two main problems are that it greatly increases debris due to the minimized motor vehicle traffic and that it actually causes motor vehicles to get closer to bicycle riders, because drivers feel that if they are not crossing the lane line, they can get as close as possible - ie well within the three foot law space.